Since Aaron had tubes put in his ears his tonsils have gotten bigger and bigger and his snoring has gotten louder and louder (I don't know if there's a correlation between tubes and tonsils, but I would like to think so.) Apparently they rate how big your tonsils are by numbers 1-4, 4 being the biggest. Now, kids tonsils peak at age 5. Aaron is 3 1/2 and his tonsils are already rated a 3+. I told the doctor all the symptoms that he has been having, like restless sleeping, coming into our room 2-3 times a night, snoring, overly tired during the day and also apnea thing too. I guess all those things are considered sleep apnea, especially the stopping breathing thing (obviously.) What I didn't know was that bed wetting was a symptom too. Aaron has only had like 3 accidents since he was potty trained so I didn't think he had that problem. Getting to my point........ The doc took one look in his month and said when can we do surgery. He is getting his tonsils and adenoids out May 23rd. I am really nervous about this I don't really know why. I know it's a really simple procedure, but I am just worried. So please keep him ( and me too) in your prayers. This morning Charlie called me at work and said that a car hit our truck and 'totaled it'. 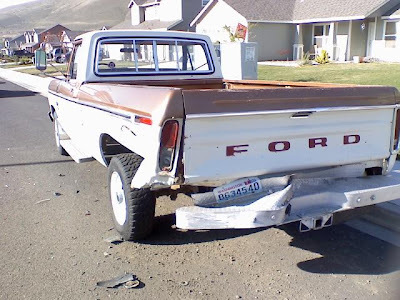 Our truck is a '73 Ford F150. It's a pretty sturdy truck. A VW Jetta smacked into it and messed up the back end. The speed limit on our road is 25mph. 25mph. This car had to be going more than 25mph to do this kind of damage. This is our first house and we love it, but so much housing has gone up around us and now our road is the 2nd busiest in our town. We has dreamed of getting a house with some acreage so the boys can play in the yard and not have to worry about crazy Jetta drivers (no offence) that pop out of nowhere. I have just not wanted to go through the hassle of moving. THIS IS THE LAST STRAW. We are going to move. Wyatt has been wheezing for 2 months now. Nothing seems to help. 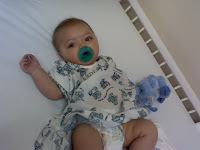 He has gone on 2 different routes of antibiotics, had 2 chest x-rays, and 2 swabs for RSV and the flu. We couldn't seem to find anything. So, on Monday the ENT doctor decided to scope his throat to take a look-see. We found out that he has Tracheomalacia. Which means he has a 'floppy airway.' When he breathes his trachea colapses. Really the only thing we can do is give it time and he will grow out of it in about a year to a year and a half. Until then, he Wheezy, the 8th dwarf. So, ever since Wyatt was born Aaron has been waking up in the middle of the night and coming into bed with us. Since we are always so exhausted we either 1. didn't care and go right back to sleep or 2. so asleep that we didn't even know he came in. Well, one week ago yesterday we decided that this has got to stop. So anytime he came out of his room before he fell asleep we'd redirect him back in. We did this about 100 times a night until he fell asleep. When he did wake up and walked into our room we'd put him back in his bed. There were some tantrums at 1:30 am. Then we went to Seattle and all that went out the window. We came back into town on Wednesday night. Did that whole process, but Charlie and I went downstairs before Aaron fell asleep. We heard his thumping around, but nothing abnormal. At 9:30pm we decided to go to bed and went up stairs to our room and this is what we found......... 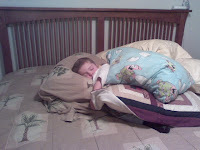 He had made a fort out of pillows on our bed and fell asleep. We still put him in his bed and guess what? He slept all the way til 7:00am in his bed. It was the best night sleep in a long time. And, he's been doing it still. Someone once said to me that consistancy works, but takes patience. I now believe them! It does take lots and lots of patience!! I just thought I would share this story to everyone who knows that patience is definately a virtue!!! We had to take Wyatt up to Children's in Seattle for follow up appointments this week. He had and EEG and a Neurology appointment. We found out that he's not having and seizures and he has no brain injury as we suspected before. He just keeps blowing all tests out of the water. He is truly a miracle baby. Maybe even has some super powers ;).. If you've never seen an EEG, it's pretty crazy. There's like 30 wires they have to stick to your head with gummy stuff. Then all those wires can read brain function. It's amazing what can be done these days!! In Seattle inbetween Wyatt's appointments we took Aaron to the Experience Music Project and the Space Needle. 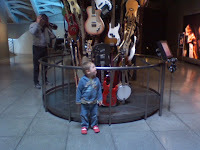 He had a great time looking at all the guitars. 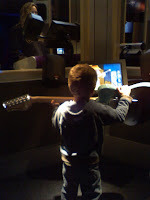 All he could say was "Look mama, Guitar Hero." He had a great time. Then he got to actually play a guitar and drums. 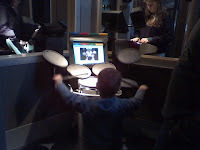 He had more fun on the drums (go figure) then the guitar. I could barely peel him away from the drums. The Space Needle was fun. At first you ride this rickety, old elevator that has glass windows so you can see outside, all the way to the top. Aaron wasn't so sure about that. Once he got to the top he had a good time. He even went outside and wanted to look down. Nothing scares this kid.